A few weeks ago, Elizabeth @ Don’t Call me Betsy started a new Friday linky party called Quilted Flashback Friday. If it opens today, I’ll update my post to link up. I made this Star Quilt while I was taking summer school college classes in 1999 to use on a double bed when I moved out of the dorms to off-campus apartment living. It is the 4th quilt I made, and I still pull it out and put it on my queen size bed for an extra layer of warmth in the winter (my husband and I sleep under 2 quilts in the summer and 2-4 quilts in the winter). In fact, it was the full time quilt on my bed from 2000 through 2004 and has been used every winter since. It measures out to 74.5 inches wide by 81.5 inches long, and I took it to a long arm quilter in Pigeon Forge, Tennessee, to have it quilted. I did not know much about quilt backing options at the time, and I purchased a queen sized yellow sheet to use for the backing. That yellow sheet has faded significantly over the years, but I am amazed at how much use this quilt has had in 14(!!!!) years and how well it has held up, really. Some of the quilting is coming unraveled, and a few blocks are starting to fray. 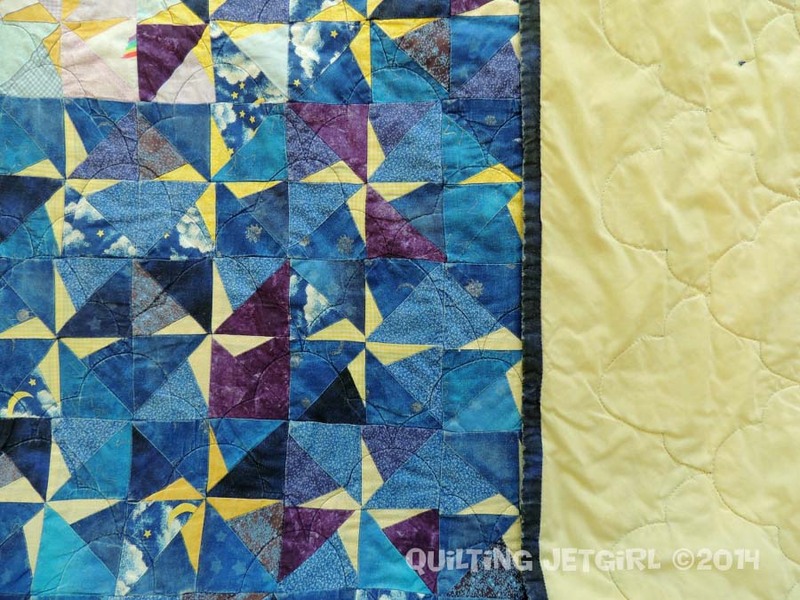 I remember that when I picked up the quilt from the long arm quilter that she told me she had broken several (5 or more) needles while quilting because of how thick the fabric is all bunched up at the center of the star points. There are 160 star blocks in the top of this quilt – 156 in the pieced center and 4 additional used in the corners of the quilt. I remember seeing this quilt in a quilt magazine and just diving right in. I cut a lot of fabric, made a bunch of blocks, and rinsed and repeated until I couldn’t take it anymore (I’m pretty sure I was originally shooting to have a queen sized quilt but abandoned that idea and went for upsizing by adding borders). The day I laid out my quilt blocks on the floor of my parents formal living room was very exciting. I got everything *just so*, and then the dog came in to “help”. Needless to say, the layout is not what I had originally wanted… but it got done! The blue and purple gingham fabrics and the fabric with rainbows are all fabric that my mother had purchased and used to make clothing for me as a little girl. I love looking at those fabrics and remembering that my mother had selected them for me when I was young. The rest of the fabric is all me. Blue and yellow and astral themes. I still love the fabric in this quilt today; it’s just so me! With the drape of the quilt over the edge of the bed, I rarely see the lighter colored corners of the quilt. Instead, when I wake up or walk into a room with this quilt on the bed, I see the rich and saturated deep blues and purples and yellows in the center of the quilt. My HSTs and star points rarely meet up in the top. I pretty much just sewed the blocks and then sewed them together without re-measuring or squaring them up. I am amazed that the quilt turned out as square as it did! I have loved this quilt, and it is far from perfect. I need to really remember that along with how far I have come the next time I get frustrated by a small detail that isn’t “just so”. Lovin’ that blue. And the clouds you quilted on top are adorable!! Oh, this is fun! And I love that you still use it! 🙂 I love all the dark blues and purples. Yum. Isn’t it fun to see how your quilting style has evolved over time? I love that your dog “helped” with the layout….too funny! I love that you included childhood fabric! If elephants can paint and sell their art for thousands of dollars, then why can’t a dog quilt too?! lol! This is a great quilt! It’s amazing how far we come along in making quilts isn’t it? My first quilt has a sheet on the back too. I love how this contains fabrics from childhood clothes made by your mum. That makes it extra special. I think it is pretty awesome, I love that some of the fabrics are from your childhood. 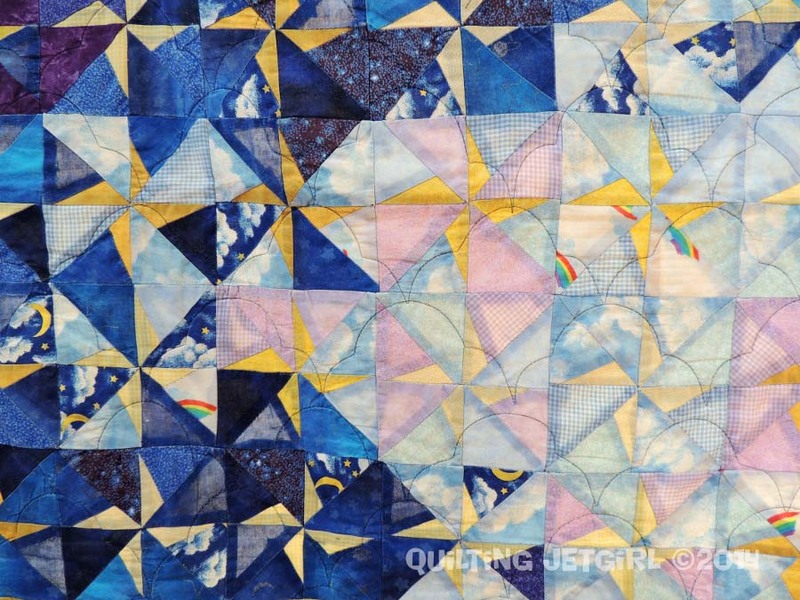 This quilt is great!I love how much movement it has from the way you’ve distributed colors and stars. Great story behind it too! Wow, that’s quite a quilt to have taken on so early, and who cares about a few points, it still looks amazing! What a great quilt, Yvonne! I love those colours too, and star blocks are always great.